The main objective of a homeowner’s insurance policy is to protect your home from loss. Homeowner’s policies pay for or reimburse homeowners for repairs that result from unforeseen damage (as opposed to blatant neglect). Most insurance policies are designed to cover unforeseen and sudden loss, such as due to natural disaster. 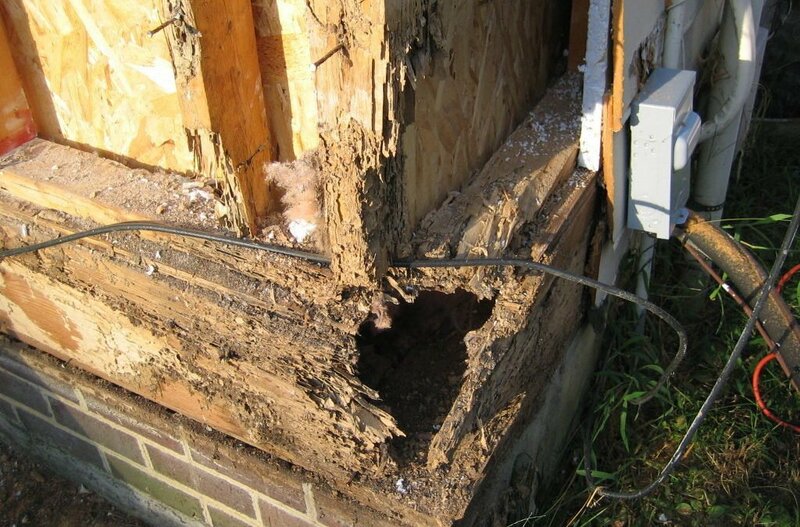 You may consider the sudden knowledge of extensive termite damage in your home to be considered such an ‘unexpected’ loss, however, your insurance carrier may not agree with your position. In reality, most insurance companies share the position that, since homeowners had ample time to perform regular termite inspections, termite damage cannot be considered a sudden loss. Insurance companies largely view termite inspections as part of the regular maintenance you should be performing on your home. From their point of view, the situation is akin to buying a new car, driving it for years without ever changing or checking the oil, then expecting the insurance company to pay when the engine seizes. If you had regular (annual) termite inspections, you would be able to nip any small areas of damage in the proverbial bud, and minimize any potential loss. Regular termite inspections and treatments also prevent termite colonies from growing, thereby preventing infestation. Is any part of termite infestation covered by insurance? Depending on your policy, there may be a minute few situations in which termite-related damage is covered. For example, if your refrigerator falls through a termite damaged floor, the refrigerator might be covered, but not the actual termite-damaged floor. Ah, insurance adjustor logic. Another scenario to consider is in the case of severe storm or flooding, by which the newly rotted wood attracted termites. The termite removal might be paid for as part of the claim for the property damaged by the storm. The moral of the story here is clearly to inspect, inspect, inspect! Allowing years to go by without inspecting your home for wood destroying pests is clearly shunned upon by insurance companies, who consider termite damage to be an easily avoidable expense. The good news is that most termite inspections are either very reasonably priced, or even free. There’s no reason not to inspect your home for termite infestation. And scheduling an inspection has never been easier…just visit www.termitepro.us, choose your date and time, and you’re set to go! One less thing to worry about. The best course of treatment for termites is prevention. It is important that you schedule a yearly termite inspection for your home, as well as routine termite treatment to prevent infestation. How frequently you need an inspection or treatment will depend on your home and location, but you may need to schedule a visit every three months, six months, or a year. Accurate Termite and Pest Control performs termite inspections and termite control in SoCal area, including Los Angeles, Orange County, San Diego, and San Bernardino Counties. Our technicians can find termites even in the earliest stages of infestation. By detecting the termites early, we can come up with a termite treatment plan that will eradicate them and prevent new infestations from occurring. We develop a termite control plan that will minimize your risk of termite infestation and will quickly eradicate any pests that do take up residence. Our team is also skilled at detecting and eradicating other pests that are common in California, including ants, roof rats, and cockroaches. Call us today to schedule an inspection! The only thing you probably want to understand about termites is how to keep them out of your house for good. You want to get rid of the ones that might be there and keep out any additional termites. Working with a termite expert to construct a proper termite pest control plan in place can help you do that, but learning a bit about termites can also help you understand how better to protect your home.